Having the US Constitution in place means we have to find compromises in order to survive in our humble opinion. While the words come from different roots and stock, they are intimately intertwined it seems. ‘Constitution' means ‘a set of rules and regulations’ to live by and ‘compromise’ means to ‘promise to accept a mutual agreement’ so the American Republic rests on our ability to do both. Of which James Madison and Thomas Jefferson knew about every single one of them, and they read about their collective demise in the original Greek and Latin. Have you? How do we know that is what they wanted? It is all embodied in the US Constitution, the greatest document ever written for secular civil government purposes. Total protection of the rights of the minority in this country. Freedom of speech for everyone at any time or place, not just the majority. Freedom of assembly for everyone at any time or place, not just the prevailing majority at the time. Freedom of religion for everyone at any time or any place, not just the prevailing majority. Presidential veto power, since he is the only official elected by the entire nation, over the duly-elected representatives of each state and each district. Super-majority of votes in Congress required for override of his veto on any bill; insures that minority party has a say in final legislation if the President is of their same political party and persuasion. Parliamentary procedures established by Jefferson led to the practice of the Senatorial ‘hold’ on any bill in the Senate where 1 Senator can hold up any bill for any reason under the sun, presumably to get a ‘compromise’ done. ‘Unanimous Consent’ needed in the Senate to advance a bill, meaning 100% of all 100 Senators agreeing to allow the consideration of a bill or amendment on the floor. Senate filibuster rules requiring 60 votes to break cloture and allowing debate on any bill to ensue. Constitutional amendments requiring 2/3rds majorities in both Houses of Congress AND ¾’s ratification of all 50 states. There are more but this should be enough for now. Now, with all of those constitutionally-installed and cemented-in-concrete principles protecting the rights of the minority in any consideration of any bill on any issue in the US Congress, how in the world are we EVER going to get anything done unless there is at least .000001% compromise from all sides to get a bill passed with 50%+1 majorities in the House and the Senate and signed into law by the President? If you have never served in a legislative body in the minority party for 1 second, (we did it for 10 years! ), you just can not appreciate just how important and critical it is to our national existence as the longest-running democratic republic on the planet that the Founders were brilliant enough to stick these minority rights in the Constitution and parliamentary procedures like a ‘bulwark never failing’ to protect all of our freedoms. And if you have not ever served and just think that all you gotta do is spew vindictive and venom and hate and demand that ‘My Way…or the Highway!’ is the way to go, then you got a lot of learning to do about ‘winning friends and influencing people’ in the legislative arena at least. Our take on such posturing is that such people are incapable of presenting the facts and ‘truths’ as they see them in such a persuasive manner so as to influence ‘the other side’ to agree with them, or at the very minimum, take their concerns into serious consideration and agree to even a tiny part of them. In other words, they apparently are not confident in their ability to educate, inform and 'sell' their ideas to a majority of legislators or the general public. This myopia applies to all sides; whether they be die-hard Republicans, Democrats, Tea Partiers, Libertarians or Martians sent to take over the Earth for the people of Mars! If the choice is between agreeing 1000% with the calcified position of any so-called ‘leader’ of any faction in American politics today and getting nothing done ever on the big issues facing us as a nation or the reasoned, thoughtful insights of guys like Madison or Jefferson as expressed in the Constitution and the points highlighted above, we are going with Madison and TJ any time of the day, week, month or year. C’mon! 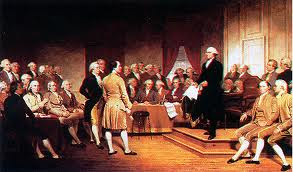 They agreed to let little ole Rhode Island come in as a state and have as many Senate votes (2) as big-state Virginia or Massachusetts or New York at the time! You think that went over well back home in those large states after Philadelphia? But it was critical to getting the Constitution passed, the greatest civil governance document ever, if we needed to remind you. We can compromise on getting the budget balanced, can’t we? $20 Trillion in national debt is coming up pretty darned quickly on the horizon, don’t you think?